This week saw over 3,000 O2Touch players dusting off their boots and breaking the touch skills out again for another spectacular spring season. Well, what a week for O2Touch Leagues across England. This week saw over 3,000 O2Touch players dusting off their boots and breaking the touch skills out again for another spectacular spring season. With just under 300 teams, across 6 venues – 4 playing nights, it has been an amazing start to what will no doubt be a cracker of a season. But, if we thought this week was busy – we have another 5 venues starting next week as well. Looks like 2014 is set to be one action packed year. Regents Park has seen a record number of teams enter this year! Across 4 nights, more than 100 teams will fight it out to be crowned the Top Dog. Both Mixed and Men’s competitions will be taking place at not only Regents Park, but at all of our London venues that also started this week. Clapham Common has once again provied to be one of our most popular venues and filed up very quickly with many teams missing out, so is bursting at the seams with teams who are eager to up their touch knowledge and be even better than the game before. With many ‘oldies’ teams returning to maintain winners status, this week we have been witness to the fact that, they are going to have to work HARD, because the new teams have a thirst for first. Clapham/Wandsworth on Wandsworth Common has also set a new record. This season we have reached full capacity for the Women’s league competition!! This is amazing news for not only O2Touch, but for Touch as a Sport. The growing participation numbers by women in the sport is just awesome to see (and it shows the guys that girls don’t always need them in a team). With a lot of development going ahead, it was great to see that London based club, Galaxy – has entered TWO women’s teams into this league (a mini army of girls who can dive and throw long balls). Clapham/Wandsworth isn’t the only venue where Women are scoring though – as the SuperLeague division played at Putney/Wandsworth (King Georges Park) – has also set a record for the number of Women’s teams. Super League is the highest standard of Touch games available in London, and it is awesome to see over 80 women being involved in this. Super League at KGP has also maxed out its numbers for the spring season (amazing!). 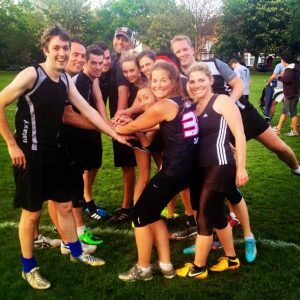 With 10 of the best London mixed teams fighting it out – this season it is a sure fire thing that some amazing touch action is going to take place! The first week at Super League saw many old rivals go head to head in the first round, to set the benchmark for the season. Not even the rain could keep the die-hards away. Perfect diving weather many of them said (that’s when you know you’re committed). Get set – because the next few weeks are going to be absolutely ACTION-PACKED and with a summer and early Autumn seasons to follow in quick succession, there is certainly something for everyone this year.